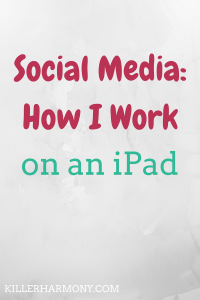 For this part of my “On an iPad” series, I decided to write about social media. Most of the time I spend on social media is on my iPad. The wide variety of apps make it easy to keep up with different social networks on the go. I have the same method for social media on an iPad as on my iPhone, and so I am going to be referencing both devices throughout this post. Social media is great to view/use on an iPad, and I actually prefer it to my laptop. There is an app for almost every social media platform. I use Twitter, Facebook and Pinterest each day. If you follow blogs with Bloglovin (which I don’t recommend), they have an app. You can use the Instagram app for iPhone on an iPad, but it will show some blank parts on the screen since the iPhone and iPad have different dimensions. Another app that I like to use, though it’s not really a social network, is YouTube. I follow vloggers on there, and I like to watch videos on my iPad. I also like to use my iPad and iPhone to manage my social media. For this, I use apps like Hootsuite and Buffer to schedule posts. I also have the app version of Canva, a graphic design website. That way, I can create graphics for social media posts on the go. If you are looking for apps to help manage or use your social media, a simple search in the app store is a great way to find cool apps. There are apps that will allow you to do just about anything. Some people use the Crowdfire app to track followers and unfollowers. I know that you can have different apps to manage Facebook groups and pages, too. I like to schedule tweets, usually the night before they go out live. I use either Hootsuite or Buffer. Depending on my goals for the next day, I will chose one or the other. Buffer comes with a set schedule, whereas Hootsuite (the app version) saves hashtags I use in scheduled posts. If you want me to do a full comparison, let me know! For Facebook, I just use the main app. They do have separate apps for pages and groups, but I only have so much space for apps. I like to use main apps, like Facebook or Twitter, to reply to people in real time. Scheduling retweets works for some, but I like to do it as I go. It makes me seem more human and less machine. YES! Using a phone or tablet for social media is amazing. A lot of social media networks have better mobile interfaces than their website counterparts. Social media is always changing and being updated, and it is super important to stay up to date. Having access to your favorite social networks on the go is a necessity, and it is easy with the different apps out there. Of course, you don’t want to get too sidetracked with social media. If you need to get some “real” work done, you need to keep yourself off of Twitter and Instagram. You can always check in during a work break. Unless you have no space left on your device for new apps (and you can’t bear the thought of deleting anything), you should definitely have at least a couple of your social media accounts ready to go. Social media apps make staying connected super easy. If you spend a lot of time on your phone, it can be easy to get distracted with social media. You just have to make sure that you are not sacrificing your work in the process. Keeping it to one or two social networks on your iPad or iPhone is a great way to still keep up with friends and family while also not giving you too much of an excuse to not do your work. What do you use to stay connected on the go? What are your favorite social media apps? Let me know in the comments or on Twitter (@HannahHaefele)!